After using vinegar to get rid of weeds, you are ready to plant. This is a guide about planting after killing weeds with vinegar. I honestly don't know what to do. This weed is everywhere this year - all over my neighbor's yard and in different parts of town. It's invasive and is starting to edge into my little patch of lawn. I want to get rid of it and plant some wildflowers and wild grass seed. I reread some of the comments, I am now concerned that the vinegar will stay in the soil way longer than the time frame I need. How long do I need to wait after application to plant seeds in the same area? Vinegar is organic and many microbes will feed on it and break it down. I can't imagine an organic fluid like vinegar hanging around and keeping its potency in the soil after a handful of waterings... Vinegar is also used to lower the ph for some alkaline soils. But is rather ineffective because it doesn't persist in the soil like sulfur. It gets neutralized fairly quickly. I can't image a weeks worth of watering, not completely flushing and neutralizing the effects of vinegar. I have sprayed straight vinegar on weeds (area 10 ft X 16ft). They're all dead. I will rake. What's the next step for a lawn? Can I add quality topsoil and seed after 4-5 days? Do I water it to clear the vinegar? How soon can I start work on new lawns? After the 5 - 6 day wait the vinegar will have evaporated. If your soil is loose rather than compacted Just put a not too thick layer of good topsoil and a little compost mix on top of the area. Rake it in then plant the seed as instructed. If your soil is compacted you will want to till it some first to loosen it up then add the topsoil and compost. There are light weight composts out there. I'm not talking about the heavy treebark kind. How long after using vinegar to kill weeds can you replant lawns? Unfortunately, if you used lots of vinegar, it can render your soil sterile for several years, so nothing will grow in it for a long time. It really should only be used where you don't chose to have anything grow, like cracks in sidewalks, between stepping stones, etc. 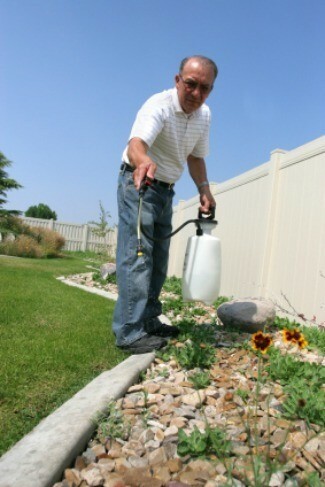 If you use it to kill weeds, just sprinkle/spray it on the weeds and don't pour it onto the soil. Vinegar breaks down the soil structure, kills beneficial microorganisms, and should be used with caution. How long does apple cider vinegar stay active in soil, so that you can plant vegetables like asparagus? How long after you use vinegar can you plant grass?